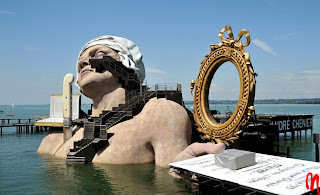 There have been some pretty crazy pastiches of David's Death of Marat, but this creation on Lake Constance in 2011 will take some beating. Note it was 24 metres high! "Director Keith Warner & set designer David Fielding have chosen “The Death of Marat”, an iconic painting by the revolutionary artist Jacques-Louis David, as the symbol & inspiration for their staging of “André Chénier”. 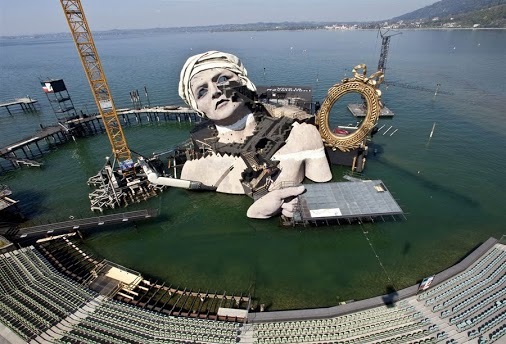 It is the first time that a historical painting has served as the basis for a Bregenz stage set, which towers 24 metres high above Lake Constance. 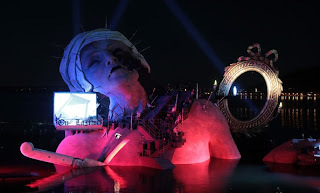 Set against the background of the French Revolution, the opera “André Chénier”, which premiered at “La Scala Milan” in 1896, is a historical drama of sharp perceptivity & a human tragedy of devastating intensity; appealing both as a passionate love story & as a historical thriller"